The kids visit a Library buried deep in the sand where they learn of an important vulnerability in the Fire Nation. Now, they must make it to the city of Ba Sing Se in time to tell the King. But Azula and the Fire Nation are already on the move, and it’s up to the Avatar and friends to stop them from conquering this ancient city. Now trapped in the desert, the kids try to make it out on foot, heading towards Ba Sing Se (the capitol of the Earth Nation). Aang is upset at losing Appa and flies on his glider looking for him, but it is no use Appa is gone. The group is running out of water so Sokka and Momo drink some cactus juice which only makes them hallucinate. Katara tries her best to keep everyone together, but it's a tough job considering Aang is upset, Toph can't really "see" in the sand and Sokka and Momo are loopy. Zuko and Uncle decide that they need to go somewhere where Azula can't find them they decide to go to Ba Sing Se. But in order to get there they need passports and Uncle knows just where to get them. We learn for the first time that Uncle is in a Secret Society that spans across all Nations it's called the Order of the White Lotus. Still traveling without Appa, the kids are anxious to get to Ba Sing Se to tell the Earth King about their plan to attack the Fire Nation and, more importantly, to find Appa. But getting to Ba Sing Se is harder than they thought. The kids pass up taking the easy way to Ba Sing Se (a peaceful ferry ride across a lake) and instead vow to help a desperate family of refugees that are unable to take the ferry. The kids lead the family to Ba Sing Se the only other way they know, through the deadly Serpent's Pass. Suki, from Book 1 Water Chapter 4, returns in this episode she meets up with the kids and helps them to cross the Pass. This chapter also marks the return of Jet from Book 1 Earth Chapter 10. Having made it on top of the outer wall of Ba Sing Se, the kids see a frightening sight a Fire Nation army is heading right towards them, and leading the army is a giant, mobile drill. The drill is several stories high and moving like a caterpillar it is just a matter of time before it reaches the wall and drills through it putting all of Ba Sing Se in danger. The kids find an Earth Kingdom army who is trying to stop the giant drill but it is no use it seems unstoppable. While still on the ferry, Jet asks Zuko if he wants to join his group of freedom fighters. 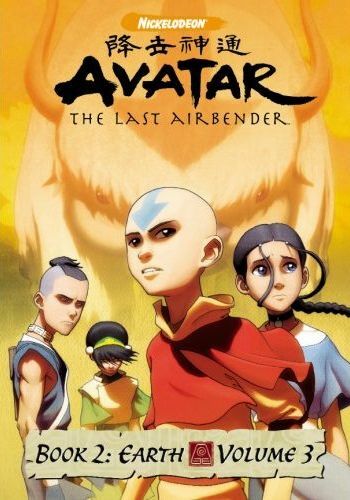 Zuko turns down Jet's offer and Jet become suspicious of Zuko and Uncle he suspects they are Fire Nation. When they all make it into Ba Sing Se, Jet and his gang follow Zuko and Uncle. Having finally made it into Ba Sing Se, the kids are given a house in the upper ring an upper class area of the city. The kids are anxious to tell the Earth King their plan but they find out they won't be able to speak to the king for a month. The kids decide that they can't wait a month and so they break into a private party that the Earth King is throwing they figure they can talk to the king here. Meanwhile, Jet and his small gang follow Uncle and Zuko, trying to prove that they are Firebenders. When Uncle and Zuko get jobs at a teahouse, Jet continues to spy on them. But when Jet can't get the proof he needs, he decides to fight Zuko -- certain that Zuko will have to use his Firebending to defend himself. This chapter consists of 6 short stories. 1. Katara and Toph go to a day spa and get pampered. Toph gets an "extra strength" pedicure on her calloused (Earthbending) feet. The girls have a mud bending fight while taking a mud bath. 2. Uncle travels around the city collecting things for a picnic. Along the way he inadvertently helps strangers in different ways. For example, he sings to quiet a baby and helps a mugger get his life on track. 3. Sokka walks past a Haiku club where people are reading haikus. When he accidentally enters the class, he finds out that he has a natural talent for haikus. 4. Zuko goes on a date with a girl who likes him. The two go to dinner and romantically stroll around Ba Sing Se. 5. Aang helps free the animals from a rundown zoo. His plan was to get them all to the agrarian zone in between the walls a place where they could roam free. But getting them through the city becomes a bigger challenge than he realized. 6. Momo, looking for Appa, runs into a pack of angry cats. The cats chase Momo through the streets of Ba Sing Se. He tries to hide, acting like a street vendor's dancing monkey. But the cats don't let up and continue to chase him relentlessly.